Lower Manhattan, once known as the buttoned-up financial center of New York, is fast becoming the hippest part of town. Brookfield Place, designed by architectural firm Morrison Dilworth and Walls [MDW] out of Dallas, is attracting thousands of residents and visitors with its world-class restaurants, fashion houses, artwork, and its unique and beautiful design. When you design a building with this much attention to beauty, you want the design of the restrooms to be equally as stunning. However, stunning wasn’t the only requirement when MDW turned to Neo-Metro for the basins. With so many people using the facilities every day, the fixtures needed to be durable as well. MDW wasn’t about to settle for off-the-shelf solutions. They wanted something customized to fit their vision. Neo-Metro was able to accommodate all three of those requirements—great design, durable, and custom made for their needs—for MDW. Specifications called for wall mounted slabs with integrated basins, integrated overflow, and integrated changing tables in both the men’s and women’s rooms. Our standard wall mounted slabs are 22 inches deep. 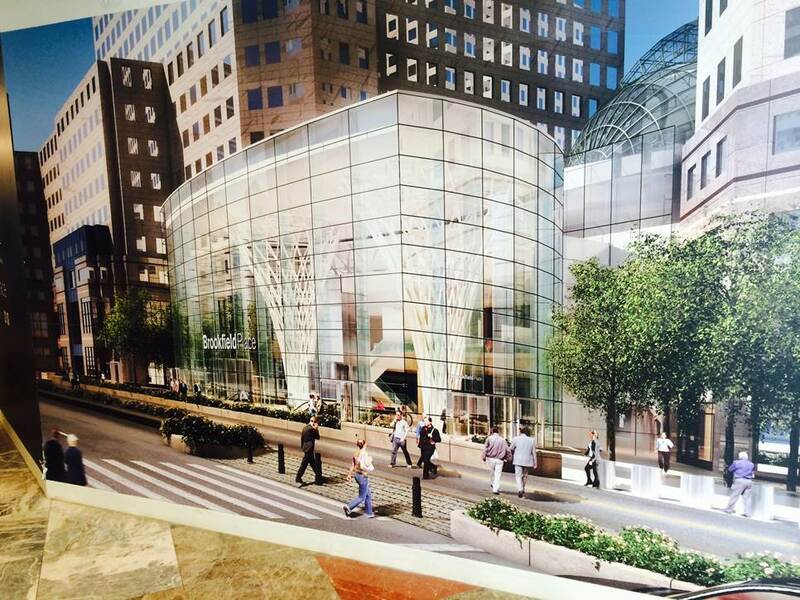 In the case of Brookfield Place, they were working with concrete walls, so a knee wall to contain the carriers and plumbing, was incorporated into the design. 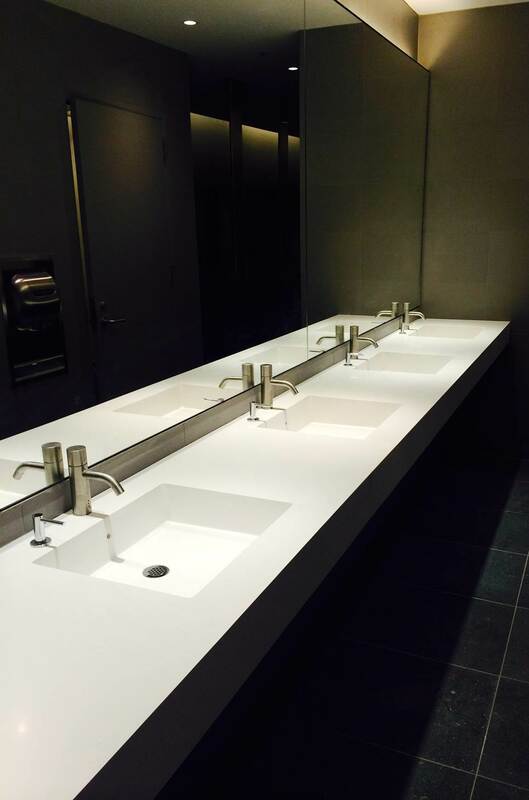 Neo-Metro created customi zed Blanco solid surface countertops, 217 inches long and 30 inches deep with six integrated basins and a changing table to accommodate the knee wall for the ladies' room. Countertops 179 inches long and 30 inches deep with five integrated basins were custom made for the men’s room. Each unit was shipped in two pieces for ease of installation. Once they were installed, and seams were filled, they looked like one solid, very durable cast solid surface that can stand up to the demands of such a busy destination. At Neo-Metro, we don’t believe you have to sacrifice quality for beauty. We also don’t think you should have to settle for what is available in stock if it compromises your design. We’d much rather custom manufacture a unit that fits your vision and your specific challenges. With your ideas, we can make anything happen.